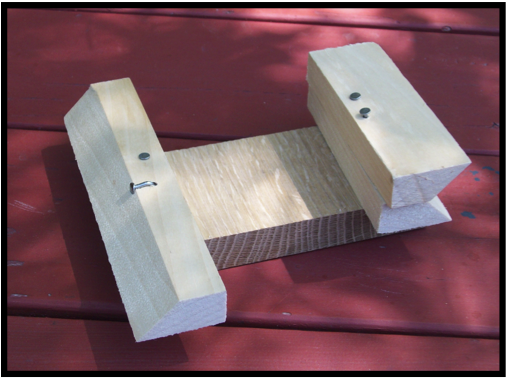 Mike, a good friend of mine and a fellow science educator, also has a woodworking shop in his garage where he custom builds fine furniture. Just before Asher and Kate's recent visit I asked Mike to save a box of wood scraps for the kids. We work together one day a week developing middle school science curriculum and on one of those days he brought me a nice box of wood scraps, just the right size for young hands. I planned to pre-drill pilot holes in the blocks and let the kids hammer and nail together as many blocks as they needed to create a project originating from their imaginations. 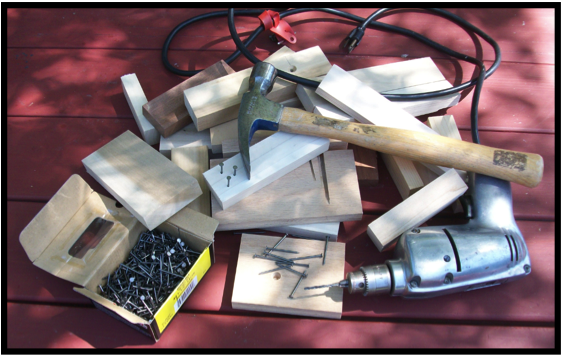 All that's needed are wood scraps in assorted sizes and shapes (no piece of scrap is unwanted as it might just be the perfect piece to fill out a construction project), an electric drill, a hammer, and a box of 4D (1 1⁄2") nails. 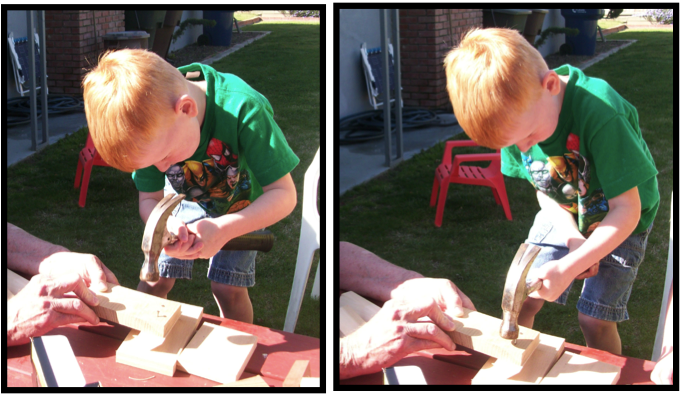 As you can see in these two photos, Asher, using both hands, has good control over his hammer and had no difficulty hammering nails straight into the wood. On the other hand, Kate thought the best hammering technique required that you first close your eyes and then swing the hammer. Fortunately, we caught her in time and she too, controling the hammer with just one hand, was able to hammer the nails straight into each bock. 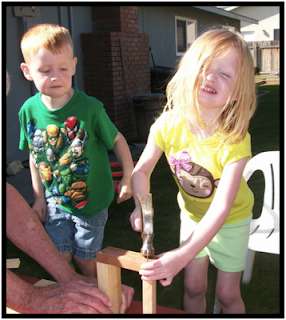 This picture shows her working on her simple doorway arch. This is the Space Shuttle that Asher built. There wasn't time for Asher and Kate to paint each project so I put them away (along with the unused blocks) to save for their next visit. I'm also saving other odds and ends (such as cardboard tubes) so they can also glue shapes made of materials other than wood to a project. Dad, they loved doing this. Thanks for taking the time to do this project with them! Up until this point, wood shrinkage and/or strength change will not be a concern. It is from this point that warping and changes in strength begin. FSP is generally achieved at 25% to 30% moisture content. 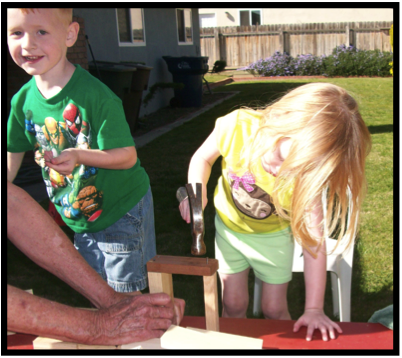 You've got some future woodworkers there, huh! Looks like they had a blast. Been going around looking for projects like this to do with my kids. Been warming up my new circular saw (saw one convincing review here) and I've got blocks of wood lying around the basement.